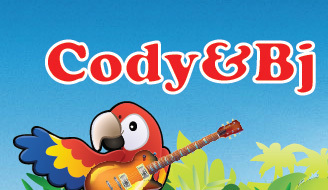 Cody & Bj have been performing high energy, interactive, original songs with fun activities that keep audiences of all ages engaged and moving. 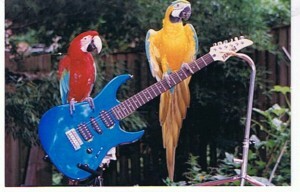 Many of our friends remember our beautiful macaws Roxie & Cheyenne. They are both retired now, with Bj taking care of them daily. During our shows we invite new friends to come and join us for each song. Children of all ages are welcome to join us on our stage and participate in both learning our songs and activities, but our friends also assist us in teaching the audience about all sorts of fun topics. We teach our friends about helping endangered animals around the world, making new friends in the community, helping each other when in need, recycling so as to reduce our carbon foot print on this beautiful planet, and many more fun global issues. We know that kids learn best when enjoying the lesson. That’s why kids of all ages have plenty of opportunities to be performers during our live shows. They are the stars, as volunteers become; band members, lead singers, “special guest star” kazoo players, limbo line leaders, hula hoopers, and more! All of our new and old friends always agree Cody & Bj know how to have FUN! It may appear like a fun rock and roll concert, (which it is), but the mission behind the music is extremely important to Cody & Bj. Starting with a small local fan base they raised their 5 children while developing and creating all sorts of fun exciting songs and activities for their live shows. We now perform our live shows year round all over the VA/DC/MD Metro Area performing in places like; private child care centers, corporate parties, public libraries, public schools, children’s birthday parties or special public events! We have found in our shows that music really is the international language. Brining people of all walks of life and nationalities together in common enjoyment of sound and beat. That’s why you’ll find kids of all ages and backgrounds having a blast, singing, dancing and performing for each other. While everyone is having lots of fun, little do they realize all the “lessons” being reinforced through their participation: respect, tolerance, patience, manners, following directions, encouraging each other to be their best and raising self-esteem, are just a few of the examples and results we strive for. We also feel it’s of vital importance that kids of all ages appreciate the beautiful planet we have and to respect and love the many animals that live here. Our environmental shows really bring this idea home, but we include this thinking in every performance no matter what the “theme”. All of Cody & Bj’s performances highlight the children as active participants in each show. All songs are written and designed with activities for children in mind. “Interactive” is truly the definitive word when it comes to describing a Cody & Bj show. All of Cody & Bj’s music is original, with a wish to inspire people of all ages to give back to society and Mother Earth, and contribute to making the world a better place. Cody & Bj raised their family in Fairfax County, in Northern Virginia, where they still reside. Their 5 kids are grown now, but the house is still full of animals, currently with 2 German Shepherds and 2 Macaw Parrots. 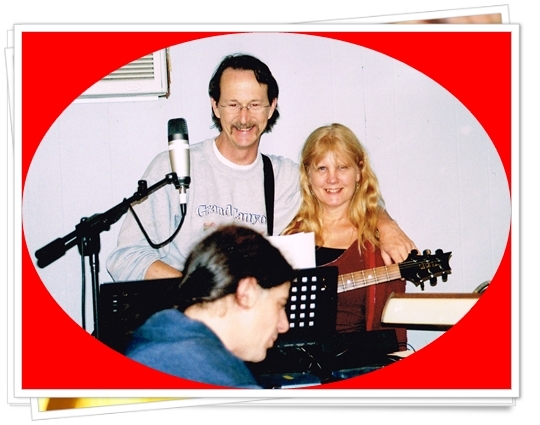 Cody is an award winning songwriter who has been in the music business for over 35 years. His years performing live, followed by his years in the jingle business writing and producing music for television and radio commercials, led him to the next stage of his career … children’s music. Bj is a constant, energetic example of optimism and activism. She has a history of being on the front lines for the causes she believes in. Whether it’s teaching people to respect and love one another, saving the environment or speaking up for the endangered species. Bj inspires people to learn how to make our planet a better place and spread the love to others. She offers a wonderful combination of knowledge, energy and creativity, making every Cody & Bj show an inspirational and unique experience for all ages. Together Cody & Bj share their message with children of all ages, just as they did with their own kids. It’s a simple message … love and respect … for each other, our planet Earth, and all the creatures that live here with us. This is our German Shepard, HARRY! He loves to chase soccer balls and cuddle on the couch. 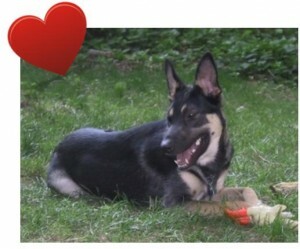 Harry is a funny dog that knows exactly how to make your day fun and full of love! 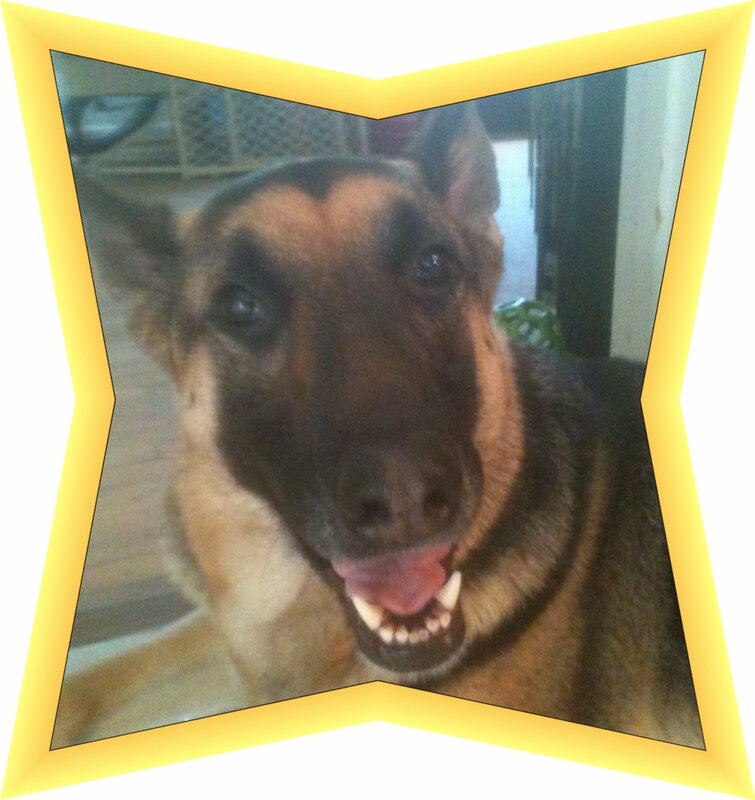 This is our other German Shepard EMMA PRANCER! She is a silly girl, and even half blind. That doesn't stop her from having fun and making us laugh! We also have two beautiful macaws ROXIE and CHEYENNE! 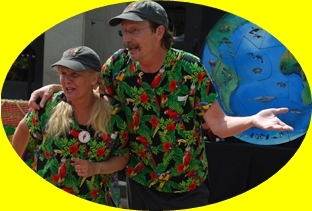 You may even get a chance to meet them because they love coming to shows to educate the public about how to protect the rainforest. They also love to climb all over their perches and say "I love you" to Cody & Bj.